If you’re one who follows Alexandra Wong’s column in the Star newspaper, you would have heard her raves and rants about this particular outlet selling amazing western food at affordable prices, located at Jalan Burma, Penang. A bit tricky to find the place, as by no means it is comparable to your swank cafe/bistro/coffee house, but rather an unpretentious, and low profile style of outlet, dishing up an amazing range of dishes to satisfy those cravings for scrumptious, yet affordable chops/pastas etc. 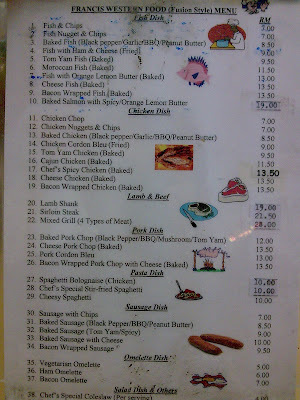 Browsing the menu may take some time, as he serves >40 types of dishes, NOT including specials of the day. But be warned though, the waiting time leans towards the longer side, bear in mind Francis, the owner and the chef, cooks all the dishes himself, and assisted by only one staff who helps to garnish and serve the plates of gluttons. The place was packed, at around 8.30pm on a Sunday evening. But we were prepared for the wait, as we’ve been there a few times before. We ordered 2 dishes to be shared among 3 of us, knowing well that the portion he serves borders on the LARGE end, and we thought of continuing our food hunt later at night. I ordered something from the Today’s Specials list, the Baked Salami Wrapped Pork, while Material Boy and MayI chose Bacon Wrapped Chicken (Baked). The drinks were nothing special, though their milk tea kind of sucked. 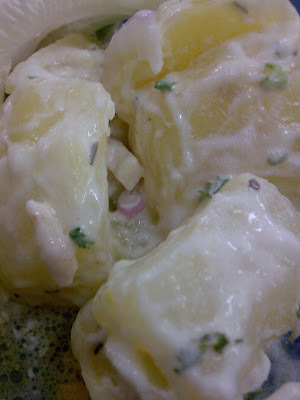 The sides of potato salad …. 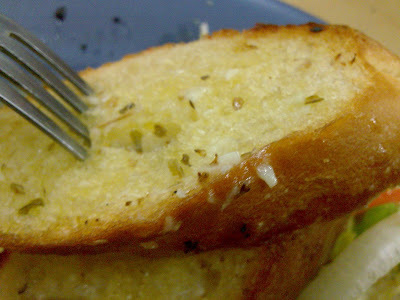 … and his yummy garlic bread. Simply mouth-watering stuff, I tell you. My dish arrived first, and the portion was humongous. This Francis guy does not skimp on the ingredients. Really. 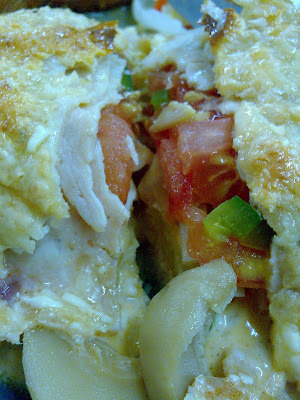 Thick chunk of succulent and juicy pork meat wrapped with cheese, ham, tomatoes, button mushrooms, and pineapple slices, the sweet juices of the meat was retained, and the baking method of cooking this dish is healthy (being optimistic here), and yet manages to contain the natural flavour of the pork. 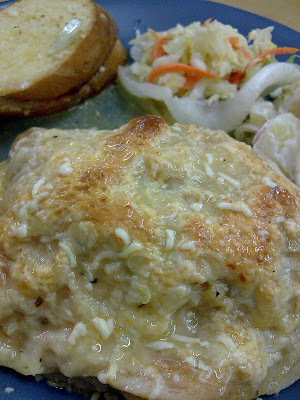 The side dishes of coleslaw (with raisins), potato cubes salad, and the fresh,crispy slices of garlic bread complemented the dish so well. Delicious. The amount of cheese coating the chicken in the 2nd dish, combined with the big, thick slices of bacon may seem like artery-clogging material, but nothing can pry my itchy hands away from salty, grilled pieces of fat bacons. Yum yum. The sides are the same. Definitely worth the money paid for both the dishes. Other recommended choices include … EVERYTHING! Basically he cooks right in full view of you, therefore any compromise in hygiene is a no-no. And you get to see the chef in action, baking and frying dishes after dishes, all the while dressed in his signature sports wear combo. (refer 1st pic). 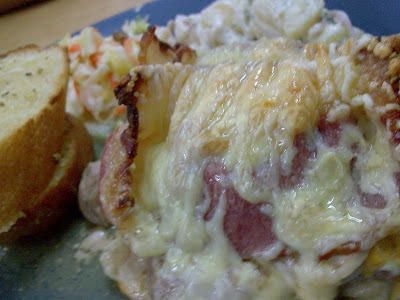 and i’m sure the baked salami dish is great..look at those bacon and cheese! nice! Aah….Francis’s western food! My ultimate fav in this tiny little shop is his’s excellent garlic bread!.. jason : hmm, economy rice can’t be that bad? you can still choose your dishes rite? szemin : hey next time let’s go together to pg again? 2 days too short to try out everything. I’m tickled pink to find this 🙂 And what a coincidence – from Ipoh too eh? Hi, sharing this info. 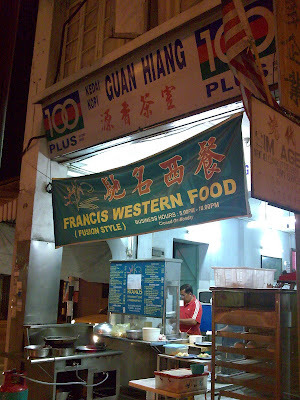 Francis Western Food is now situated at Hock Kheng Coffee Shop, Pulau tikus. Actually they closed for 3 years and now they are back. As an old customer, of course I’m happy to hear that. Open 5-10pm, closed on Sundays.